Pouring a concrete slab was one of the community service projects that we undertook at Siempre Verde Lodge in Mastatal. 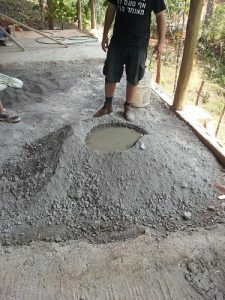 I took interest in the concrete floor making because I wanted to learn the process of it, what materials are needed, and how long it usually takes to finish concrete flooring. I did not have prior knowledge or experience in this type of work, so I wanted to try something out of my comfort zone. Overall, I enjoyed the experience and I learned that mixing and pourting a concrete slab/floor was truly hard work. The main ingredients to make concrete are water, aggregate (sand, rocks, and gravel), and cement mix. Felicia, Tim, Rodrigo, Gil the Mastatal volunteer, and I had to transport gravel approximately 75 yards to the mixing site. We put the gravel in bags and used a wheelbarrow to carry them to the site. We needed thirty bags of gravel and 100 pounds of cement. 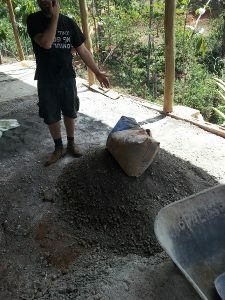 Then we had to mix the gravel and the cement thoroughly by a method called “stick and flip.” Stick the shovel in the mix and flip it on the other side of the original pile to make a new pile. This was done three times until the gravel and cement were mixed properly. Next, the pile was made into a “volcano” and it was filled with water. Then, we dug up from the sides of the mix and placed it around the brim of the volcano hole. This was part of the process, so the mix can absorb the water. After the water was covered by the mix, we had to stick and flip again. The previous step was done again. The concrete was placed in the wheelbarrow and more water was added. It was mixed until the concrete was really thick. The concrete was placed on the ground and we started layering it. We took note that the upper part of the flooring should be sloped, so if it rains the water will drain properly. The measurements had to be exact and precise. I found out that it took two and a half hours just to create a patch of flooring. At this point my back was aching, but at the end of the day each of us had a smile on our face. We are fortunate to have experts who are passionate this type of work, and I fully appreciate it because people who take things for granted think flooring appears out of nowhere. In reality, there are people who dedicate their time, effort, and work hard to provide us with flooring, walls, homes, etc. 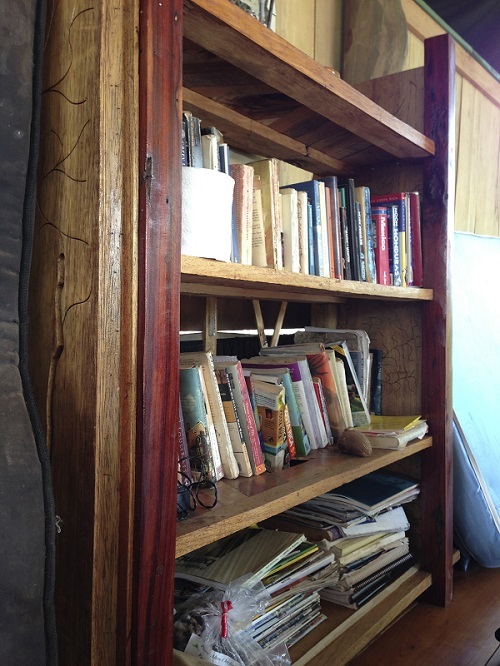 Aside from construction and building, wood is also used as an art medium. From traditional to the modern styles, wood has been used since the first human-like species started leaving their mark on Earth. Wood may be used for sculpture, craft, and decoration (chip carving, wood burning, marquetry, etc.). While in Costa Rica, we saw other forms of wood art like basket weaving and furniture making. For most of our trip, our group stayed at Siempre Verde in Mastatal. Siempre Verde is an organic farm with lodge accommodations owned by Marcos Garcia Guzman, who also acted as one of our tour guides. Marcos designed and built Siempre Verde. His talent and creativity in wood art are displayed in his structures and furniture. 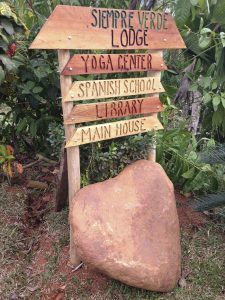 When you arrive at the farm, there is the sign “Siempre Verde Lodge” welcoming you to this amazing place. 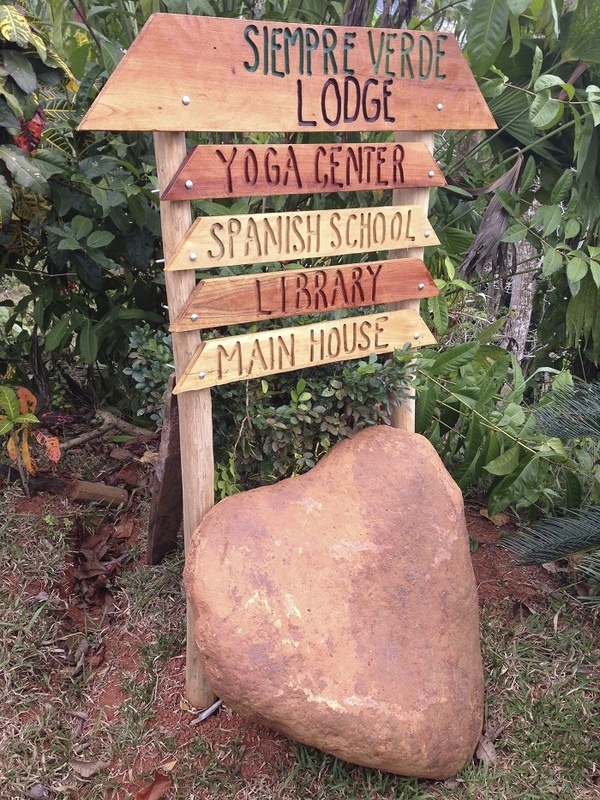 This sign is made entirely out of donated wood and scraps from previous projects. Below the main sign, it describes a few of the amenities that make this farm unique and fun. This goes with the overall theme of the lodge: sustainable and eco-friendly. 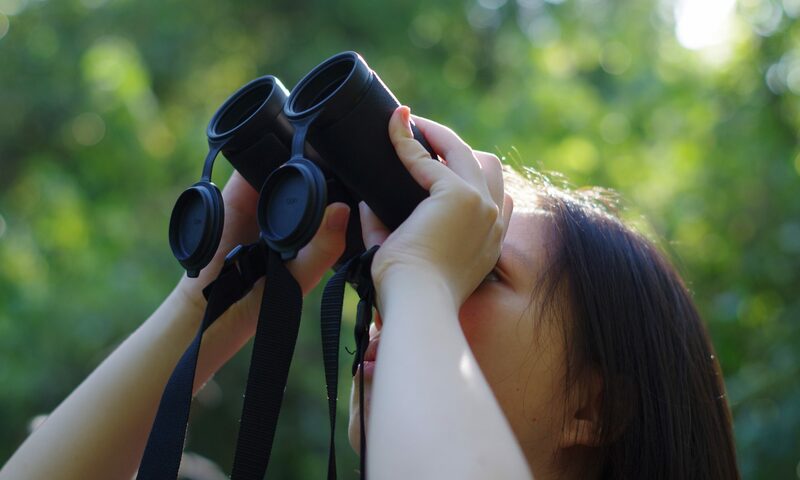 It is important to note the title of the lodge in English translates into “simply green.” Marcos hopes to keep the place as natural as possible and to avoid harming nature and the wildlife as little as he can. His largest project thus far is the lodge structure that contains the yoga deck and guest sleeping accommodations. The entire building was made from donated wood (various types of wood are used like Purple Heart, Brazilian wood, and Teak). 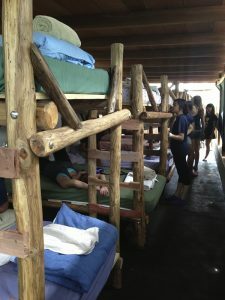 With the help of volunteers, visiting interns, and family, Marcos was able to build the lodge structure, furniture, and decorations out of wood. From bunk beds and chairs to bookshelves and candleholders, his team designed and created it all from scratch. Lau ren, Vivi, and I were fortunate enough to be a part of Marcos’ wood making team. During one morning of the week, he showed us all of his wooden creations around the farm and taught us how to make a cutting board, mirror, and table. For the cutting board, he showed us how to make it with leftover wood, a table saw, and glue. We were able to put a crafty design on the top surface by adding different colored wood (Purple Heart and Brazilian). For the mirror, we used leftover Teak wood and a scrap mirror. We used the table saw again to make little slits on the wood to create an off-center, two-sided frame. The table was the most complex out of the three projects. 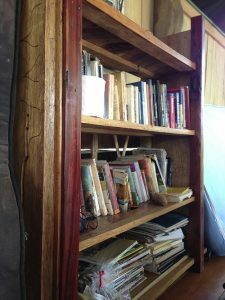 It involved three pieces of teak wood, a “tree cookie” (thin cut out of a tree trunk), scrap Purple Heart and Brazilian wood, an electric sander, machete, sanding paper, electric screwdriver, glue, table saw and varnish. 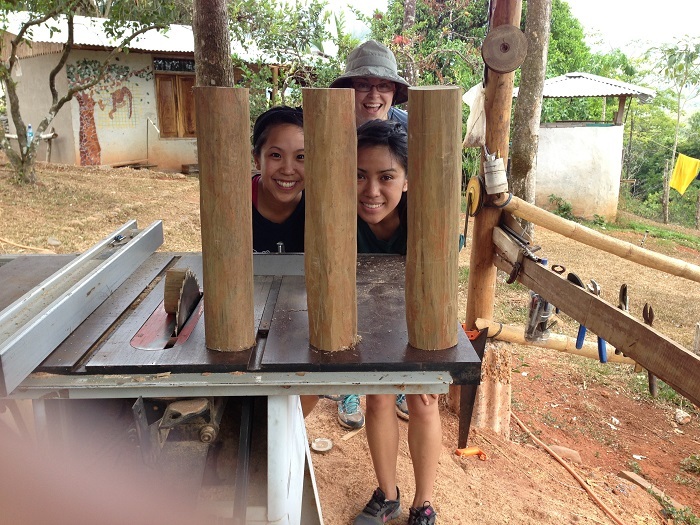 First, we sanded the three teak wood pieces. Then we used the screwdriver to make two holes in both the tree cookie and teak wood for each piece. We used the machete to sharpen the Purple Heart and Brazilian wood pieces so they would act as nails and hold together the table. We placed those pieces into the teak wood pieces (they formed the legs) and made holes in the tree cookie. After securing the pieces with glue, the table was held together perfectly! Although it wasn’t geometrically perfect, it was beautiful because of its natural look and handmade appeal. Wood design is so crafty and unique. This type of art is almost always made by a wood craftsperson. It adds to the art piece’s value and gives it a personal touch. A few of us ordered animal wood carvings from the local wood craftsman of Mastatal. It will be arriving in a few weeks. When it arrives, it will be a reminder of our wonderful wood crafting experience.